Will my recruit need to have the app before I can send any mail to him? No, your recruit does not need the Sandboxx app before you can send any mail to him or her. You can enter your recipient's address in Sandboxx and send a letter to them even if the recipient is not listed in the Sandboxx app. How do I get in contact with my recruit? If you sign up through a text link, you will be automatically connected to him or her in the app. Ok, I've signed up but I don't see their address? All bases vary in terms of when they send their form letters home to the parents and loved ones, so it's important to wait either until that form letter comes or if you happen to get an updated address from the base. So, I should use Sandboxx to write letters? Yes, Sandboxx is a quicker, more convenient way to send letters to your recruit. 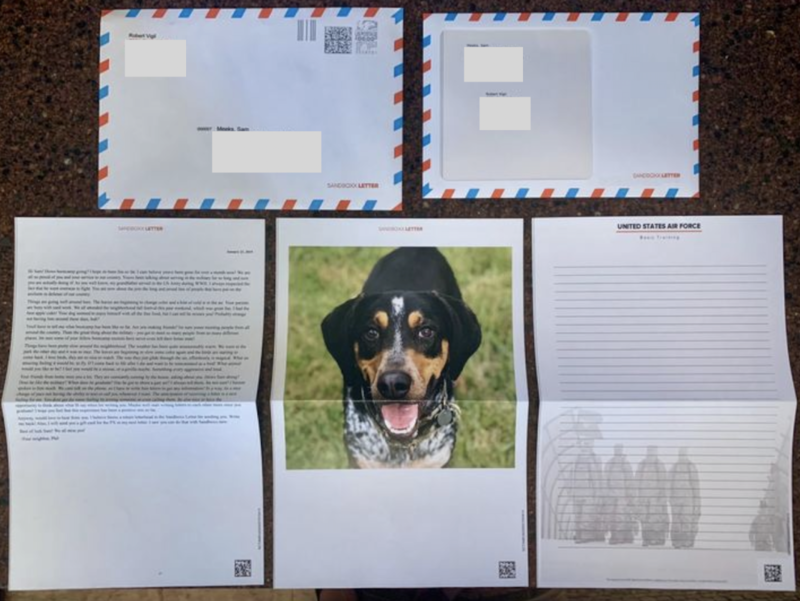 Each letter is printed and securely sealed at our office in Arlington, VA and includes a full color photo (if you choose to add one), a self addressed return envelope, and tracking with overnight shipping to 11 different bases. See the complete list of bases that we overnight to here. What does a Sandboxx letter look like when it is printed?